Mortarion - Unboxing video, breaking into sub assemblies, and finished model! So, Tyler has asked that I paint him up a Mortarion. Since this is my first go round with this extremely large and fantastic model, figured I would do a few items leadinng up to painting him. 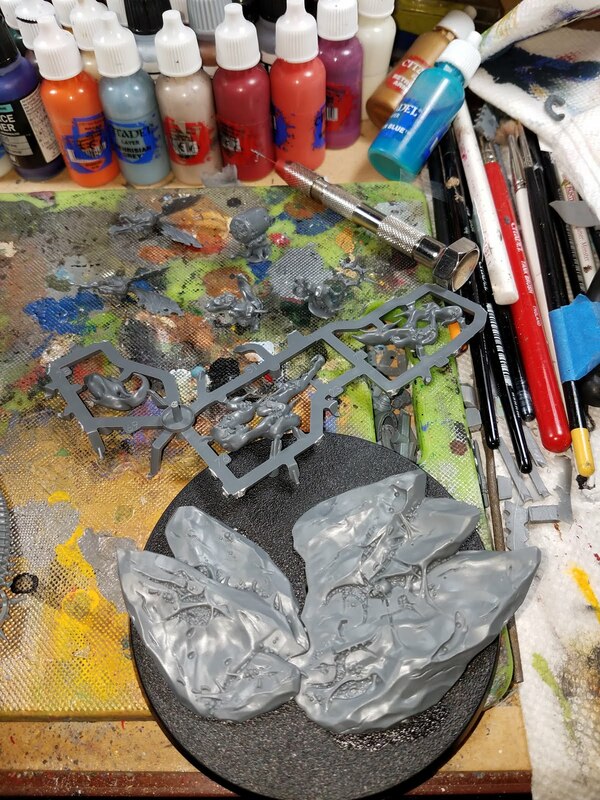 Okay, this is a HUGE model, and they crammed all of his pieces into 2 sprues. The parts are scattered everywhere, and I scratched my head when looking at the arms. That scythe arm, no matter which way you configure the model, seemed to be off. Okay, so I broke the model up into 2 groups, based on primer to be used. For the wings, nurglings, fly guys, billowy smoke, and base, I opted to go with Vallejo 73.615 USN Light Ghost Grey. In addition, I did some pre-painting, namely on the wings. 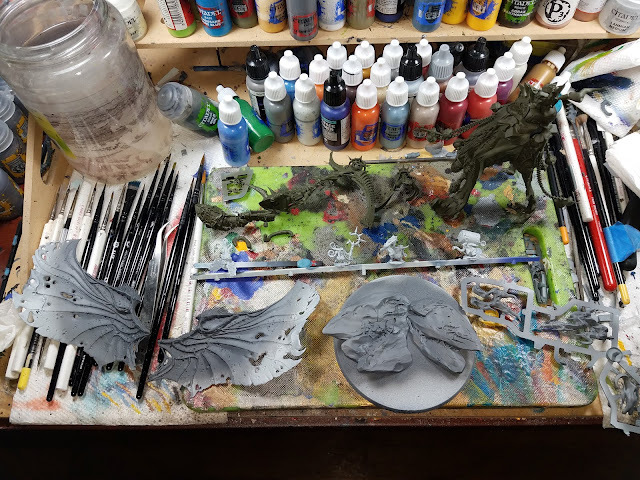 I went from LGG almost to black on the wings, mixing in small amounts of Vallejo 74.602 black primer. This will be further blended with successive drybrush highlights on the wings and billowy smoke. For the main body, I went with Vallejo 73.609 Russian Green. It has a rich olive drab color, and works great for a nice base to Mortation. Here we are, all primed up. I left the arms, head, and wings off for ease of painting. I will assemble as I go, starting with the main body, then the arms, head, then wings, and finally, attachment to the base, and then the addition of the little dudes here and there. 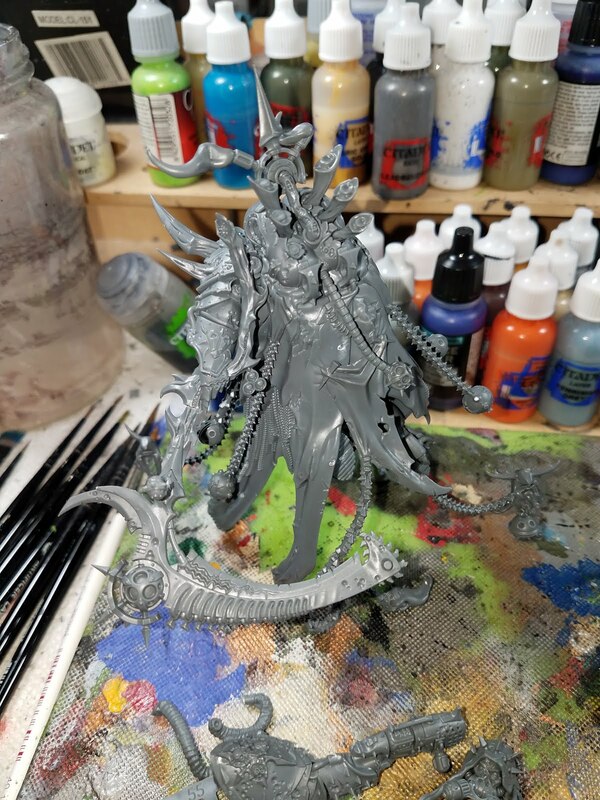 This model is going to be fun! I painted him over the course of 3 days, spending maybe 5 hours a day on him. I painted the entire model to match the color choices of the Death Guard Squad I painted here. After the full strength wash of GW Agrax Earthshade and allowing it to dry, I attached the arms to the model. I then followed the instructions to completion, adding smaller details as I went. I left the wings to the end, as they are big and cumbersome. 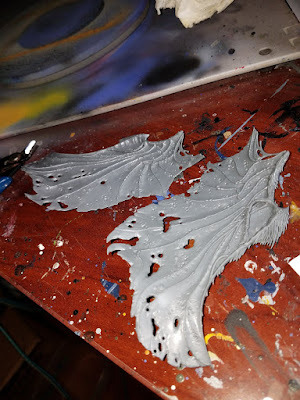 For painting the wings, I applied successive drybrush highlights, going through GW Eshin, Administratum, Dawnstone, and Ulthuan Grey, feathering it out towards the edges. I picked out the little boils in GW Emporer's Children Pink, and Leadbelcher to the piping parts. I then applied a thin glaze (50% Lamhian Medium, 50% Agrax) of GW Agrax to the wings, making sure it did not pool up. You can see the red really offsets the body, and makes the focus point his body, and not the wings. You can see the striations of grey that were originally airbrushed on, going from dark to light grey. For his face, I stuck with the lightest grey used, and then applied an Agrax Earthshade wash.
And this is why I love taking pictures of my models after they are finished - I can see things I missed, like the little spikes holding the purple cloth on. Here is a better picture of the flipped scythe blade. When I attached the billowing smoke piece, I turned it to look as if he had the scythe going through a back swing, after having reaped the enemy with it. And some poor slob is going to be looking down the barrel of the lantern soon enough! I left the extra nurglings off the base because I thought that they looked dumb. I mean, the little fly guys were cool enough and tie into the model, but the other ones don't really tie in as well, so would have been a detraction, at least to me, with the final model. 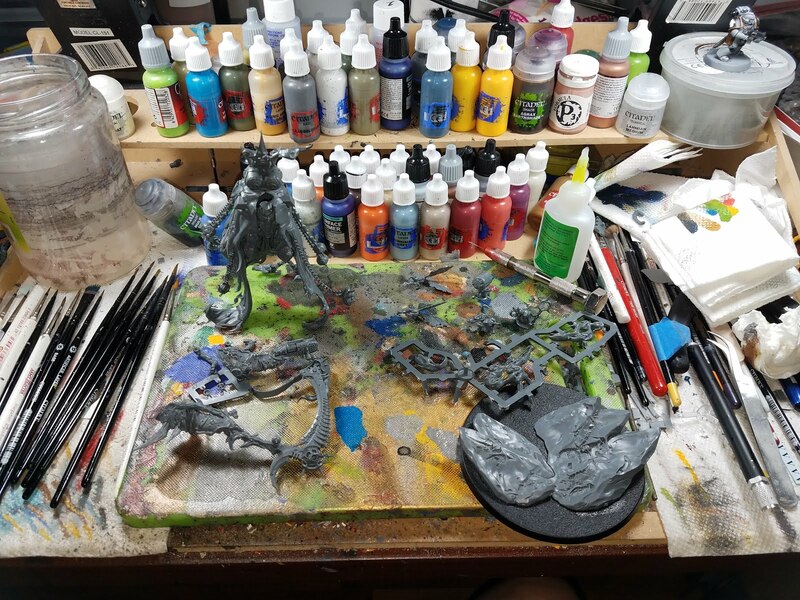 A blast to paint, but a beast if not broken into assemblies before hand. 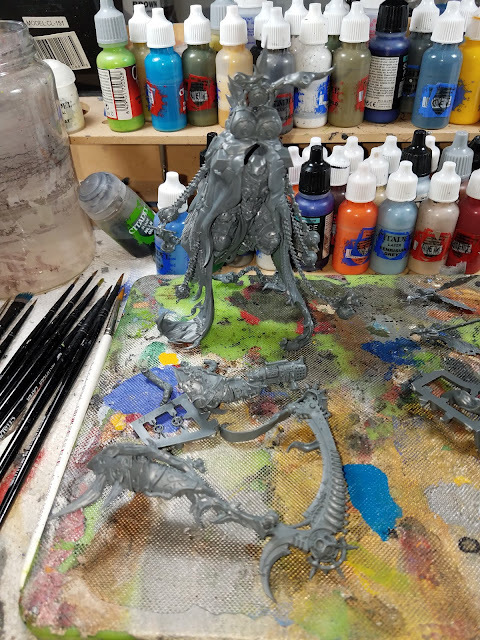 Now, go forth and do Grandpa Nurgle's Bidding my friends!